Andy Rubin, Android's co-founder and now vice president of engineering at Google, has revealed a new milestone for the mobile operating system: half a million devices activated daily. "There are now over 500,000 Android devices activated every day, and it's growing at 4.4% w/w," Rubin wrote in a message on his Twitter account. That's over 3.5 million devices every week and over 105 million devices every month. Last month, the daily number was 400,000. In December 2010, it was 300,000. In August 2010, activations passed the 200,000 per day mark. As you can see, the milestone updates are coming in more frequently. It's thus worth looking at Rubin's second statistic. A growth of 4.4 percent week over week means we'll see 600,000 daily Android activations by next month. At this rate, it also means we'll see 1 million Android activations daily Android activations before the end of the year (if the growth does not change, which of course it will, the milestone will occur in October 2011). The devil is in the details though: previously Google was saying the number was phones activated each day, while now it is saying Android devices. 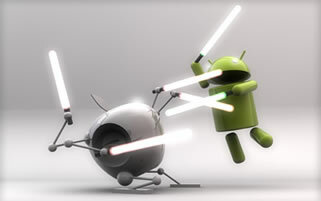 This means tablets and other hardware running Android is being counted now. There's nothing wrong with that, but it's an important thing to remember. In October 2010, Apple CEO Steve Jobs talked about Android and iOS activations during his company's quarterly earnings conference call. At the time, Google had said it was activating 200,000 Android devices per day, while Jobs revealed that Apple was activating 275,000 iOS devices each day. In sheer activation numbers, Google is now very likely beating Apple and its iOS platform, which includes iPads, iPhones, and iPod touches. We're curious if Apple will bother share its latest activation statistic at its next event.